Growing up I was a very picky eater. When I didn’t like what my mother had prepared for dinner, I would usually just say, “I’m not hungry” and make myself a peanut butter sandwich. As a grown up, my food choices have changed a great deal, in fact, I enjoy trying new things and watching to Food Network for good ideas. One of the cooking tips that I have picked up from all of the foodie shows I watch is to use fresh herbs, whenever possible. Believe it or not, that green spring of parsley on my plate at restaurants that used to repulse me, has actually become a part of my regular cooking repertoire. Turkey meatloaf just wouldn’t be the same without it! My homemade pizza now seems bland without fresh basil. The one herb that I just can’t get cozy with is Cilantro. It turns out that I’m not the only one. There are lots of people who also dislike the flavor of these green leaves, as well as their seeds (aka. 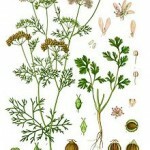 Coriander). The plant produces molecules called aldehydes, that determine its scent and taste. It turns out that aldehydes are also found in soaps and lotions, hence the soapy taste that some report. 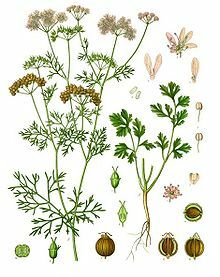 It is known that genes play an important role in taste, but there isn’t sufficient data in this field to pinpoint specific genes or gene variants to explain the Cilantro phenomenon. It is also known, that the evolution of taste and smell has played an important role in our survival. It’s possible that the cilantrophobe’s distaste is a result of the choice some of our European ancestors made when they turned their noses up at the herb, hundreds of years ago. In the article, “Cilantro Haters, It’s Not Your Fault” by Harold McGee of the New York Times (http://www.nytimes.com/2010/04/14/dining/14curious.html?partner=rss&emc=rss?) cilantrophobia can be overcome, through association of the flavor with positive experiences. Makes sense, but I’m not sure I’m even willing to try! Print article This entry was posted by Amanda McBrien on April 14, 2010 at 1:44 pm, and is filed under DNA From The Beginning. Follow any responses to this post through RSS 2.0. You can skip to the end and leave a response. Pinging is currently not allowed.